George North admits he must start producing his club form for his country if he is to avoid a Six Nations snub. Wales boss Warren Gatland this week hinted that he will find it difficult to alter the team that beat South Africa 12-6 in the final autumn international. And with the Six Nations opener against England now two weeks away, there is speculation that North, who did not face the Springboks due to concussion, could only make the bench. The Saints man will vie with Scarlets player Liam Williams for a wing berth and has vowed to up his game in the bid to stake his international claim. 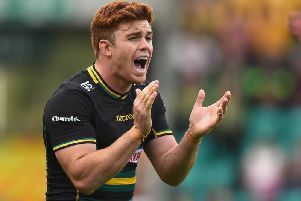 “Everyone knows the character that Gats is,” said North, who has scored 11 tries for Saints this season. “He likes to put things on people, especially boys he thinks he can get more out of. “I’ve come up on his radar and, myself included, it hasn’t been going as well in a Welsh jersey as in a club shirt. “It’s up to me now to put my statement back and that’s the culture we’ve bred in Wales: that no man is safe in his jersey and you’re only as good as your last game.